We carry a vast array of smoking materials and accessories. Contact us today 7709922060. 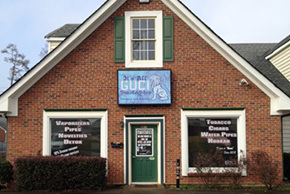 It’s all Guci Smoke Shop is Marietta’s choice for all things related to a smoking lifestyle. We carry a vast array of smoking materials and accessories as well as the best in vaporizers, electronic cigarettes, and E Liquid. Smoking is more than a habit at It’s all Guci Smoke Shop; it’s our passion. If it’s yours, join us and take a wondrous trip through our world of fun and fantastic puffery. Our products are all tried and tested and available at the lowest prices you’ll find in the Marietta area. At It’s all Guci Smoke Shop, we specialize in vaporizers for smoking and only carry the most reliable and highest quality. A vaporizer is a portable digital gadget that heats up tobacco rather than burning it so the smoker can avoid some of the more harmful effects that burning can bring. We have a variety of vaporizers in various colors and patterns to fit your style. It’s all Guci Smoke Shop also carries kratom, the herb that is only now being discovered in the West. Kratom hails from Southeast Asia and has been used there for centuries by natives who would chew the leaves for pain relief and a mood boost. Some have compared the effect with drinking coffee. Our kratom comes in a variety of forms, is tested, and is of the highest quality and purity. And it’s purely legal. We have it all for those in the market for electronic cigarettes. E cigarettes have become popular as a way to detox from cigarette smoking. We stock the most popular brands and offer an ever-growing selection of flavors and strengths in E Liquid. And, as always, our prices are the lowest in the Marietta area. At It’s all Guci Smoke Shop, it’s all about your satisfaction. We keep our most favorite items stocked at all times so you’ll never be without. And our staff is experienced and knowledgeable about all the products we carry and are more than happy to explain anything that is new to you or to help you choose from our amazingly vast selection. Our smoke shop has gained a reputation for its quality, price, and variety. In fact, fans have given us four stars on Headshopfinder.com. When you become a fan, too, we invite you to “like” us on Facebook and get 10 percent off your purchase. And you can go to our Facebook site to find out all about our weekly specials and view product photos. So come and enjoy the smoking life at It’s all Guci Smoke Shop where you can find whatever you need under one roof. Call us for details or directions.